The front contains the power button, a level controller, and a headphone jack for monitoring the sources. When I bought a Beige G3 in 1998, I bought it with Apple’s A/V personality card. This added S-Video in and out, and RCA audio/video in and out, to the back of the computer. I’ve become very spoiled by that card and those ports, and that’s one of the reasons it took me so long to upgrade to a newer computer. I’ve been waiting for a good, moderately inexpensive FireWire audio in/out device for a few years as I’ve been looking towards getting a new computer that didn’t have the Beige G3’s beautiful little A/V ports. USB ones all seemed to be USB 1.1 or just not mention speed in their specifications. 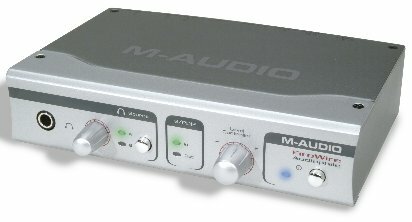 When I found the M-Audio FireWire Audiophile at what I think are new low prices, I read the reviews, read the specs, and put in an order. The manufacturer’s standard retail price is $349.95 as I write this, but everyone is selling it for less than half that. I got mine on Amazon for under $150. The Audiophile came with a four to six pin FireWire cable and a six to six pin FireWire cable. It also comes with an AC adapter, which you need to use if your FireWire connection is only a four-pin connection, as the four-pin variation does not pass power to the device. There were also three CDs in the package. Besides the drivers, there is a “lite” version of Live 4, and a demo CD of Pro Sessions. The package doesn’t come with a printed manual. One is on the CD, although you’ll probably want to download the latest version from M-Audio’s web site. Installation is easy, but strange. You run a program, choose the appropriate installer from a list of models, and then it opens a DMG file with that installer. You then double-click the installer inside the DMG file. It seems as though the whole process ought to be more automatic. The installer requires admin privileges, but successfully asks for it, even in a non-admin account. Installation also requires a reboot. On reboot, OS X (I’m using 10.4.2) requires you to fix (or disable) the startup item’s permissions. I don’t know if this is a 10.4 issue, as I’ve seen it at least once before on another install. 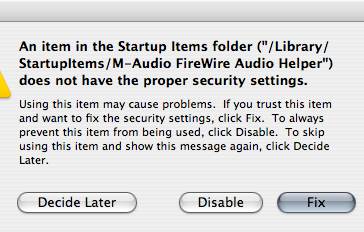 This may just be a new Mac OS X 10.4 security feature, but its a bit annoying to have to deal with. What’s happening (from a check of the permissions before and after telling OS X to fix them) is that some of the files in the driver startup folder are owned by the user I installed as rather than by the root user. I know from testing in earlier versions of the OS that this requirement, that startup items be owned by root, appeared sometime after 10.2. The installer installs a preference pane icon, but choosing it in System Preferences just launches the M-Audio application. They are extremely paranoid about people hot-plugging the device. There is a red sheet of paper warning in several languages not to hot-plug. The M-Audio application warns you not to plug the device in if you start up the app and it does not detect a connected device. There is a sticker over the FireWire ports warning you not to hot-plug the device. Where most such stickers are easily removable, this one does not come off in one or two easy passes, but must be scraped off. The box also comes with an application called Live Lite. Live Lite looks pretty cool, but also very complicated. I haven’t used it yet. You should download the extended manual from M-Audio’s web site, as it is much more useful than the quickstart manual. For example, the extended manual mentions but the quickstart does not, that there is no default routing for sound output. 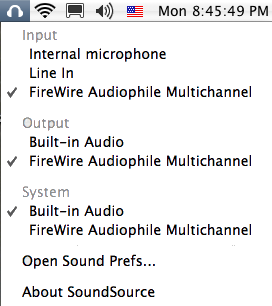 If you go into Mac OS X’s sound preference and choose the Audiophile, you still won’t get any sound until you tell the Audiophile where to route the sound it’s getting over FireWire. Once it is plugged in, when you turn it on the blue light next to the “on” button flashes for a second or two as the Mac loads the driver. Then it is available in the Sound preference pane or the SoundSource menu if you use Rogue Amoeba’s SoundSource. Rogue Amoeba’s SoundSource makes switching between internal and external speakers easy. As I write this on my iMac G5 (2 GHz), I am also ripping The Alan Parsons Project’s Eye in the Sky. I’m using Sound Studio from Felt Tip Software. I’ve also opened some applications (including Firefox), and captured some screen images. Nothing particularly processor-intensive, but the only problem I had was when capturing the mixer window, the sound play-through temporarily stopped. The levels display showed that sound was still being imported (and a check after the album finished showed that it was). That may have had something to do with clicking on the mixer window in order to get the snapshot. 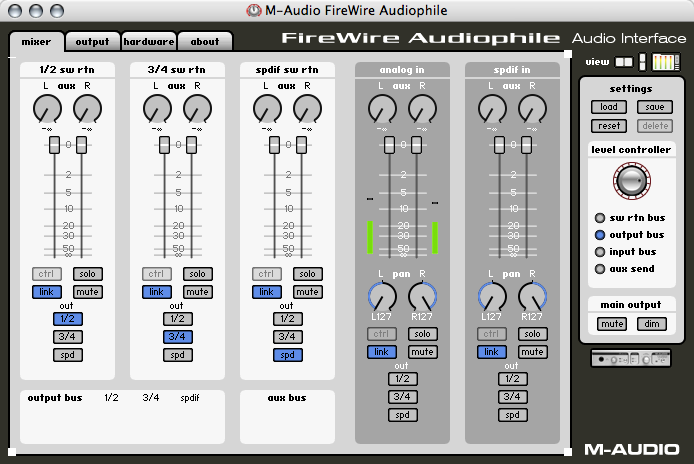 The FireWire Audiophile works for importing anything that has standard audio out. Besides vinyl, I’ve also imported some great songs from the Last Waltz DVD. The sound quality is great. That’s about as technical as I’m going to get, as I don’t have any of the equipment (or skill) necessary to get more detailed; read their specs in the downloadable manual for more information. The unit grabs all the power it needs from the FireWire connection, at least on my iMac G5. I’d really like more guidance from the manual on when or whether to use the included power supply. Is it included solely for use with 4-pin FireWire connections? Or is it generally better to use the power supply instead of the FireWire bus for power? It certainly is nice not to have another power supply to worry about, and would really make the device useful for portable work. The back sports two FireWire ports, two S/PDIF ports, two MIDI ports, two sets of stereo outputs and one set of stereo inputs. In any case, I’ve been using it for weeks on my iMac, which supplies 8 watts through its FireWire bus, with no problem. I am not a professional user. I’m using this as an easy way of connecting my computer to my stereo system for both audio playback and audio import. I am seriously under-utilizing the power of this device. It even claims AC3/DTS passthrough, although I’m not sure what applications on my Mac send more than just stereo out. For my purposes, it works great. It also is marketed as a semi-professional tool for public performance. For this purpose it has simple controls on the front of the device, and quite a few more controls in the M-Audio FireWire application that the system preference starts up. In order to test the Audiophile’s usefulness with a laptop, and to retry the installation procedure, I did a limited test with an old titanium Powerbook. This configuration is not officially supported: my laptop is a 400 MHz G4, and the minimum requirements for Audiophile on a G4 is 667 MHz. On installing, the installer is a little more forgiving, telling me that only 500 MHz is required. It lets me install it anyway. The first thing I notice after installing, shutting down the laptop, and plugging in the Audiophile is that the laptop does not provide power to the unit while the laptop is asleep. This indicates that you may not want to follow the advice given in some reviews to simply put your computer asleep when connecting the FireWire cable: the advice might only apply to computers (such as this laptop) that shut down power to the FireWire bus while asleep. Computers that continue to provide power while asleep (such as the iMac G5) might run afoul of the big red warning I mentioned during installation. A short test of importing music from the radio and sending music to my stereo shows that the 400 MHz G4 does fine at those simple tasks. The Powerbook also appears to supply enough power to the unit over Firewire; I did not need to use the AC adapter. The bottom line is that I like this little device a lot. For music playback it makes switching to my stereo as easy as using the SoundSource menu. No more plugging in and unplugging a 1/8-inch jack. Importing music is just as easy. Once more I am spending free time listening to my old vinyl and importing it at the same time. Last weekend I finished the last of my grandfather’s Tony Orlando & Dawn. This weekend I’m hoping for some Glenn Miller and, to prepare for Christmas, a Perry Como Christmas album. And tons of movie and TV quotes from DVDs. If $140-$150 seems an expensive means of getting South Park quotes into iTunes, well, it probably is. But if you import audio on a regular basis and you’ve become tired of continually plugging/unplugging your line in, this is a great way of easing the process with a quality audio to FireWire converter. For portable work, it is more clearly useful. It is light, and while it won’t fit inside your laptop’s bag it is still compact. You can easily set up two stereo outputs, switch between them, and even switch the monitor port between them. It even lets you connect an outboard effects unit using the S/PDIF ports. It’s a pretty cool device. Its biggest annoyance is going to be that annoying warning that you should turn your computer off before connecting it to your FireWire port. For desktop work it isn’t a big deal since you can just leave it connected all the time. For laptop work, though, turning off every time you use it will be a pain. Some reviewers have said that they haven’t had any problem connecting while the computer is asleep; but that may just be chance. I know that the FireWire bus on my iMac does provide enough power when asleep to light the LEDs on the front of the unit. If you can get around that one annoyance, however, this is a very useful device. I am very happy with this purchase, even if it does mean I’ll be listening to Alan Parsons again. This compact FireWire audio/MIDI interface is a great, simple device for inputting and outputting music and sound. Makers of SoundSource, Audio HiJack, NiceCast and other interesting, fun, and useful tools. Felt Tip Software is marketing their latest version of Sound Studio through Freeverse. Sound Studio is great software, although I’m not sure if I’m willing to pay the now-doubled price for version 3. A classic eighties album, “symphonic and spacey” says one Amazon reviewer, the highlights are the title track and Psychobabble. This is one of those albums that is best found in a discount rack at the local vinyl retailer. The best version of “The Weight” was during The Band’s last concert. Scorcese imparts a film quality to this documentary, and has compiled a fascinating look at The Band and the last songs. These sleek black speakers are easy to set up and deliver some nice sound. Both the Pioneer DV-400V-K and the OPPO DV-980H DVD players at the top of my list not only play DVDs and CDs, but also accept USB flash drives with music and photos, and will play my MP3 files and my iTunes-created M4A files. What is the Mac Mini, really? Is the iMac Mini really designed for switchers? Or is there some loftier goal in mind? Napster president Brad Duea says that owning music isn’t the point, we should just be happy for the experience of being around music. A new music download site from MP3.com founder Michael Robertson promises restriction-free, consumer-friendly music and more money for artists. Sometimes you have to spend money for quality. M-Audio FireWire Audiophile last modified May 25th, 2009.